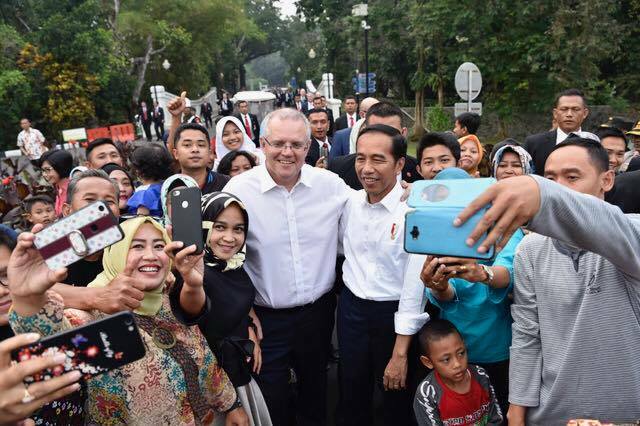 Australian Prime Minister Scott Morrison and Indonesian President Joko Widodo in Indonesia this week. Tariffs on major Australian agricultural exports to Indonesia will fall following the conclusion of Indonesia-Australia Comprehensive Economic Partnership Agreement (IA-CEPA) negotiations on Friday. Indonesia is Australia’s fourth largest agricultural export market, led by wheat ($1.3 billion in 2016-17), sugar ($541 million) and beef cattle ($620 million). .
Duty free access for 575,000 head of live male cattle per year, growing at 4pc per year to 700,000 at year five of the agreement. Immediate or gradual liberalisation of tariffs applicable to boxed beef and sheepmeat exports to Indonesia – whereby those tariff lines not already benefiting from 0pc tariffs secured under AANZFTA, will benefit from either a 0pc or 2.5pc tariff on EIF (down from 5pc) with the tariffs being eliminated altogether over five years. Similar advantages will be extended to frozen offals – with the 5pc tariff eliminated on EIF of the agreement. Guaranteed duty free access for 500,000 tonnes of feed grains per year (wheat, barley, sorghum), increasing at 5pc per year to 775,664 tonnes. Reducing the tariff on Australian sugar cane from 8-12pc to 5pc. Immediate elimination of 5pc tariff for milk and cream, concentrated or containing added sugar or other sweetening matter. Immediate elimination of 5pc tariff for grated or powdered cheese, of all kinds. Immediate tariff cut mandarins from 25pc to 10pc for 7,500 tonnes per year; down to 0% after 20 years for an unlimited volume. Duty free access for 10,000 tonnes of oranges per year, increasing 5pc each year. Duty free access for 5,000 tonnes of lemons and limes per year, increasing 2.5pc each year. Immediate tariff cuts for potatoes from 25pc to 10pc for 10,000 tonnes per year; after five years tariff further reduced to 5pc for 12,500 tonnes per year, increasing by 2.5pc per year. Immediate tariff cuts for carrots from 25pc to 10pc (from 25pc) for 5,000 tonnes per year; down to 0pc after 15 years for an unlimited volume. Progressive elimination of 5pc tariff on Australian honey after 15 years. In a joint statement Australian livestock and red meat industry groups welcomed the signing of the Indonesia-Australia Comprehensive Economic Partnership Agreement (IA-CEPA). Chair of the red meat industry’s IA-CEPA taskforce David Foote said Indonesia was a vitally important customer for significant quantities of Australian live cattle, beef and offal and has a steady requirement for sheepmeat, albeit smaller volumes. “IA-CEPA will not only deliver additional trade liberalisation by building on the ASEAN-Australia-New Zealand FTA (AANZFTA) outcomes, it will also provide a framework for a more market orientated import regime. This in turn will deliver benefits for both our sector as well as the Indonesian supply chain – including importers, retailers and foodservice operators,” Mr Foote said. “On behalf of the livestock and red meat industry, I extend our thanks to the Australian and Indonesian negotiating teams for their tireless effort over several years. “IA-CEPA is a most welcome addition to the suite of FTAs the Australian Government has concluded to date with key trading partners. “In an increasingly competitive market, whereby Indonesia is granting access to numerous beef suppliers, a removal of these import tariffs will assist in maintaining Australian product’s cost competitiveness. Mr Foote indicated that the conclusion of the negotiations is just the beginning of cementing the close relationship between our two countries. “Shoring-up the trade relationship via IA-CEPA will be jointly beneficial – but importantly this will need to be matched by ongoing close dialogue coupled with effective industry and government partnership initiatives as we continue to navigate a rapidly changing global trading environment,” Mr Foote said. Cattle Council of Australia said the strong relationship between Australia’s beef industry and Indonesian customers would be boosted through the historic trade agreement. “Indonesia is such an important partner for our industry, not just as our most important live export market, but also thanks to its growing intake of boxed beef products,” Cattle Council president Howard Smith said. “The Australia-Indonesia beef supply chain is a genuine partnership, linking producers, processors and exporters in Australia with importers, feedlots, retailers and consumers in Indonesia. The IA-CEPA would deliver additional trade liberalisation by building on the ASEAN-Australia-New Zealand FTA (AANZFTA). In 2017, 512,871 Australian cattle were exported to Indonesia, along with 49,689 tonnes of boxed beef. To July 2018, 290,150 Australian cattle have been exported to Indonesia this year, along with 36,812 tonnes of boxed beef. “On behalf of all producers, Cattle Council acknowledges the important work of the Australian and Indonesian governments and industry representatives who have secured this important economic agreement,” Mr Smith said. “It gives producers even more confidence about the ongoing partnership we have with our Indonesian customers in meeting their growing demand for red meat, whether that be with live cattle or boxed beef. Mr Smith said Cattle Council works closely with the Australian Government to ensure that beef producers receive favourable outcomes when negotiating trade agreements and removal of economic barriers to international markets. “We’re proud to be continuing in that role while further free trade agreements are pursued,” Mr Smith said. “The future of Australia’s beef cattle industry is heavily reliant on the competitiveness of our product in export markets where we vie for market share with beef from other countries”. GrainGrowers described Indonesia as “a country of boundless opportunity” for the Australian grains industry. “A country with 263 million people, Indonesia is forecast to grow to 295 million by 2030. It will become the world’s third largest economy by 2050,” CEO David McKeon.said. Mr McKeon said that currently Australia’s grain trade to Indonesia was almost exclusively wheat for milling purposes, however, IA-CEPA would directly allow more diversity and growth in Australia’s grain trade with Indonesia in the future. He said that GrainGrowers, on behalf of Australian grain farmers and the broader industry, had been working tirelessly with the Australian Government to ensure that grains was central to the trade agreement. “We are thrilled with the outcome and the benefits this new trade agreement will provide to Australiangrain growers and the broader industry,” Mr McKeon said. Mr McKeon said that thanks to IA-CEPA, Australia would now have access to the rapidly growing Indonesian feed grain market with a new 500,000 tonne duty-free tariff rate quota for Australian feed grains, including feed barley, sorghum and feed wheat. GrainGrowers’ Trade and Economics Manager, Luke Mathews acknowledged the efforts by the government in pursuing a high quality agreement with Indonesia, and looked forward to the official signing of the agreement and subsequent ratification by both countries, as soon as possible. Mr Mathews said IA-CEPA would cement the existing relationship between Australian and Indonesian milling wheat industries while allowing new trade, investment and relationships to flourish between Australia’s grain industry and Indonesia’s food manufacturing, stockfeed and livestock sectors. A great outcome for Australian exporters. Let’s now ensure that Indonesia gets a “good outcome” from this agreement as our genuine partners, and not just a country to our north that “buys stuff from us”. Certainty and stability of demand encourages investment. Sounds good.